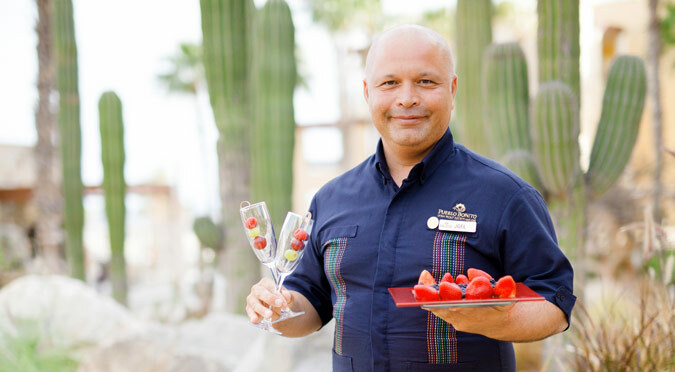 CABO SAN LUCAS, Mexico (August 31, 2016) – Pueblo Bonito Pacifica Golf & Spa Resort – the award-winning luxury resort catering exclusively to adults – believes in no boundaries when it comes to elevating the guest experience. This December, that philosophy will be taken to new heights with the debut of The Towers at Pacifica – an ultra-luxe, multi-million-dollar expansion featuring upscale suites and guest rooms, exclusive VIP lounge, new gourmet restaurant concept, beachfront bar, and state-of-the-art fitness center. With sophisticated design elements and unmatched signature amenities, The Towers at Pacifica will set a new standard for luxury all-inclusive resorts in the Los Cabos market. At the center of this expansion will be Pueblo Bonito Pacifica’s commitment to luxury without limitations, with a world-class, bespoke 24-hour butler service. Trained meticulously by the British Butler Institute – the world’s most exclusive butler and front-of-house training school – Pueblo Bonito Pacifica’s butlers view themselves as artists of service, going above and beyond to deliver extraordinary, customized service to each and every guest to make their experience unforgettable. Pacifica butlers will be hand-selected by senior leadership and complete an immersive, multi-week training at the resort to further refine their craft. Every room at The Towers at Pacifica will have 24-hour butler service, and each suite will have its own dedicated butler. The Towers at Pacifica will begin welcoming guests December 22, 2016. Advance reservations are now being accepted and can be made by visiting www.pueblobonito.com/the-towers-at-pacifica. Nestled on a secluded 2.5-mile stretch of pristine beach in Cabo San Lucas, Pueblo Bonito Pacifica Golf & Spa Resort is a luxury all-inclusive resort catering exclusively to adults seeking a tranquil oceanfront hideaway. A modern yet elegant approach to design and architecture presents an ideal setting for a memorable vacation of relaxation and self-renewal. An award-winning resort and spa destination, the 154-room boutique retreat features four restaurants, four bars, the Armonia wellness-inspired spa, 5,800 square feet of meeting and event space and access to a private beach as well as wine and tequila tastings. Coming winter 2016, Pueblo Bonito Pacifica will unveil The Towers at Pacifica, three new ultra-luxury buildings that feature enhanced amenities and first-class personalized service, including 24-hour British Butler Institute-certified butler service to attend to any and all guest needs. The Towers at Pacifica will also include an exclusive VIP lounge offering culinary experiences and specialty cocktails, state-of-the-art gym and a new gourmet restaurant – all with dramatic oceanfront views.